At this writing, The Economist's readers prefer Obama 8,146 to 3. No, that's not a typo, it really is a ratio of 2700:1. I should point out, The Economist is a conservative newspaper. Of course, as McCain's supporters would be quick to point out, their readership is almost exclusively highly-educated, well-read, and wealthy, not the sorts of people you'd want to hunt moose with. Good thing they're not running the world or anything. President Clinton, the "tax-and-spend" Democrat, left office with a $122 billion surplus. 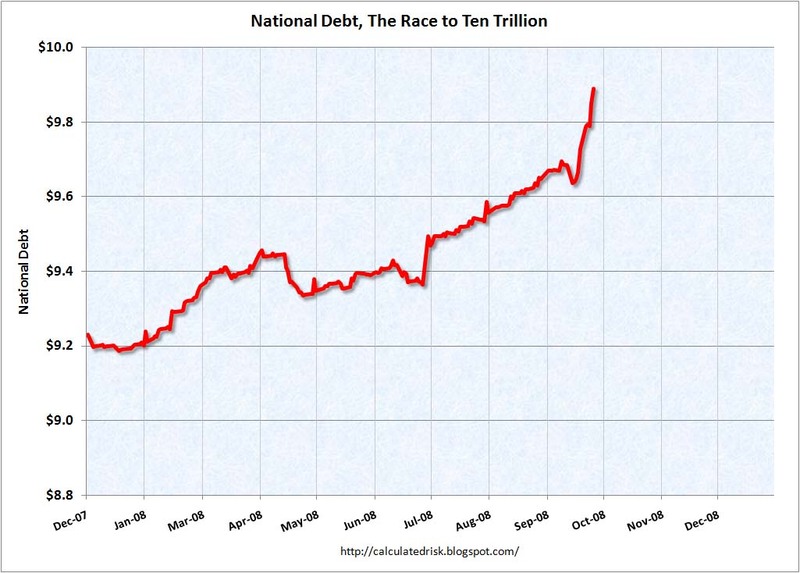 President Bush, the "conservative" Republican, is on track to leave office with a $10,000 billion debt. I say $10,000 billion because "$10 trillion" seems smaller than "$10,000,000,000,000" but is in fact the same number. Or put another way: Clinton, +$122,000,000,000; Bush, (-$10,000,000,000,000). More personally: Clinton left every American with $428.07 in Government surplus; Bush will leave each of us $33,000 in debt. President Clinton had a Republican (i.e., hostile) Congress for 6 out of 8 years. President Bush has had a Republican (i.e., friendly) Congress for 6 out of 8 years. So, tell me again, which party uses your money more responsibly? Are you better off than you were 4 years ago? Eight? Are you angry yet? Polls open in 35 days and 4 hours. I used population figures of 295 million for 2000 and 305 million for 2008, which probably gives Dubya the benefit of the estimate. Polls open in five weeks (and a few hours). If you have a few extra bucks, you may want to donate to your party's congressional or senatorial committees, particularly if you're annoyed with today's vote. You can also harrangue your neighbors: check out FundRace to see who's giving what to whom. I remember, back in the halcyon days of last week, when a certain (very) senior Senator from Arizona swooped in to save the bailout plan. Well, today, with 60% of Democrats voting for it and 67% of Republicans voting against it, I'd say he did everything he could. But 778 points? Ouch. Good work, Johnny Boy. In a moment of historic import in the Capitol and on Wall Street, the House of Representatives voted on Monday to reject a $700 billion rescue of the financial industry. The vote came in stunning defiance of President Bush and Congressional leaders of both parties, who said the bailout was needed to prevent a widespread financial collapse. Interesting times. Kind of like 1931. The Cubs lost to Milwaukee today, giving Milwaukee the wild-card and the Cubs home-field advantage on Wednesday against the Dodgers. I'll miss a good hunk of the second game, as it's against the Vice-Presidential debate Thursday (unless they schedule a day game). I sincerely hope that the Dodgers play no better than they did all season (4 games above .500 at this writing; their final game is in progress), but of course the Cubs winning the division series at home on Tuesday wouldn't be too awful. I won't be live-blogging the debate; but Josh Marshall is. [T]he grown-up thing is to do something to rescue the financial system. The big question is, are there any grown-ups around — and will they be able to take charge? [T]here do seem to be some adults in Congress, ready to do something to help us get through this crisis. But the adults are not yet in charge. What's he afraid of, really? If John McCain doesn't have the courage to debate Barack Obama, how's he going to stand up to Putin? Or José Zapatero, for that matter? BARTLET: Well ... let me think. ...We went to war against the wrong country, Osama bin Laden just celebrated his seventh anniversary of not being caught either dead or alive, my family’s less safe than it was eight years ago, we’ve lost trillions of dollars, millions of jobs, thousands of lives and we lost an entire city due to bad weather. So, you know ... I’m a little angry.